This dish is a staple in my house as well as a wonderfully nourishing and delicious salad. 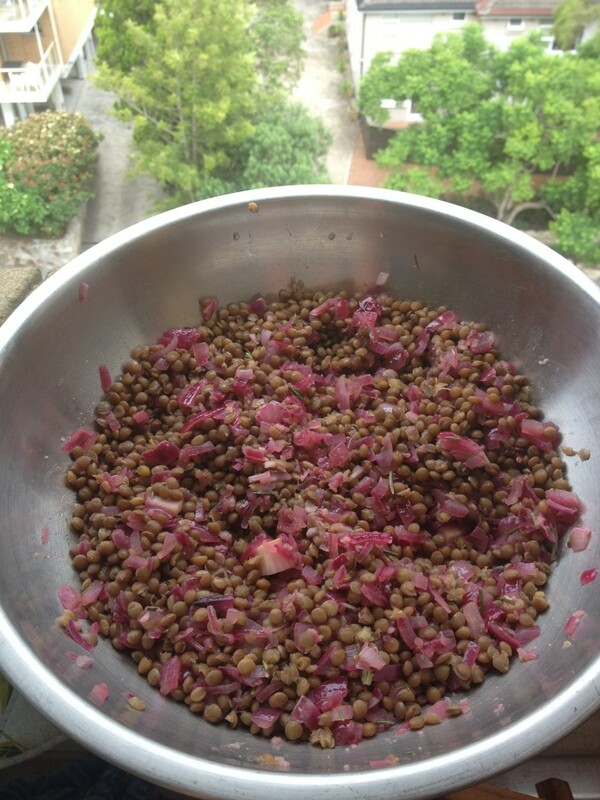 Key ingredients – lentils and quinoa. These incredible ingredients are so versatile and once you trial a few recipes yourself; you will find your own swing with them. Lentils are some of the most nutritious, and at the same time economical, foods in the world. They come in a variety of colours and are a rich source of protein, folic acid, dietary fibre, vitamin C, B vitamins, essential amino acids and trace minerals. 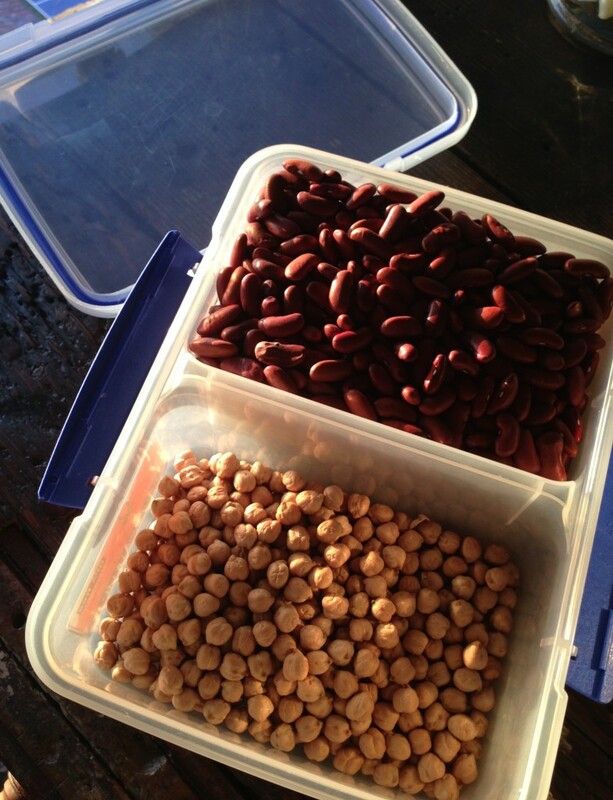 The crucial point however with cooking and eating lentils (all legumes in fact) is their packaging. The most readily available source; do not be fooled into this being cheaper; of lentils is in cans. What you need to know though; as I learnt about some time ago; is the presence of a chemical within these cans. Bisphenol-A (BPA) is a high-volume chemical found in the epoxy resin coatings used on the inside of metal cans for food. It can also be found in polycarbonate plastic, which is labeled with the number 7; in plastic food wrap, and even in refrigerator shelving, water bottles, plastic food storage containers, water pipes and flooring. It has been used by manufacturers in various plastics for over 50 years. It must be said that BPA can also be found at very low (trace) levels in the environment and in human breast milk. Also very interesting to note is that it has been banned in the EU, the US and Canada. The Australian perspective on this issue is from Food Standards – Australia/New Zealand who have long argued that there is no case for restricting BPA. They have gone on record to state “…(the) overwhelming weight of scientific opinion is that there is no health or safety issue at the levels people are exposed to”. So what is the concern here?? BPA disrupts our endocrine system; as it mimics the hormone estrogen. Studies have shown harmful biological effects on animals using low-doses of the chemical and harmful effects on humans have been observed outside of studies. Anyone concerned about BPA in consumer products is advised to choose those products packaged in glass containers rather than plastics or metals. HOWEVER I would advise to buy them dried and therefore fresher; avoid this chemical completely! More on the preparation required below…. The quinoa grain is a relatively new addition to the Western diet, but has been cultivated by the native Incas of the Andes Mountains in South America since before 3000 BC. The Incas considered quinoa to be sacred and it was known as Chisiya Mama – the mother grain. Although often referred to as a grain or cereal; quinoa is not strictly either because it is not a member of the grass family. It is actually a species of goosefoot (Chenopodium) – so called because of the shape of the leaf – grown primarily for its edible seeds. Included in the wonderfully long list of quinoa nutrients is its’ high protein content. It contains all eight of the amino acids generally regarded as essential for humans and is therefore a complete protein source. Quinoa also provides us with niacin, iron, phosphorus and potassium. This wonder food is high in unsaturated fats and lower in carbohydrates than most grains with calories coming in at about the same as a serving of brown rice. Plus it’s simple to prepare and deliciously filling. This is a brilliant lunch or dinner and will make your heart sing. You’ll feel nourished, content and happy!! 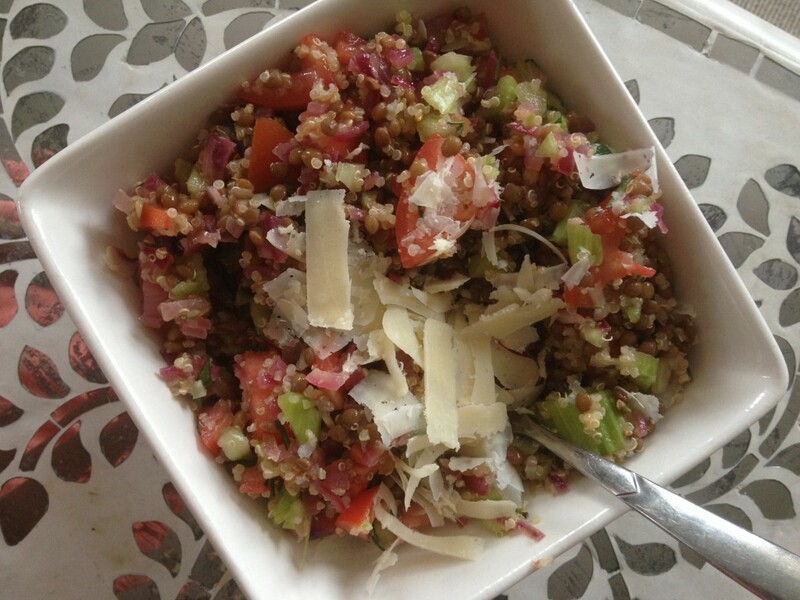 Play around with the recipe and for less calories and grains simply remove the quinoa. However in doing this you should keep in mind you are lowering the protein content also and should look to add another source – grilled chicken or even eggs would be yummy too!! Another suggestion would be to make more of the lentils and quinoa for other recipes in the week as preparation and organisation is your best friend after a long day!! Add quinoa to a medium saucepan and cover with water bringing to the boil and then lowering to simmer for 15 minutes until cooked (soft) Should the water evaporate before the quinoa is soft do not fear! Simply pour more cold water in the pan until quinoa is done! Serve in bowls and top with parmesan - YUM!!! One Response to "Lentil and Quinoa Salad"